Biorestoration is the only clinic in Utah that is offering HD Liposuction and we are proud to have highly trained experts performing these treatments. HD Lipo is a minimally invasive treatment to contour and shape the body, performed under local anesthetic. Our HD Lipo procedures are carried out at our own local clinic in Draper, Utah where we tailor each procedure to the individual. Our patients will always be given our full attention and we will work hard to ensure you receive the kind of results you want – whether it’s an athletic, masculine figure for men, or more subtle, feminine curves for the women. HD Liposuction uses the most advanced technology to breakdown fat cells using a harmonic vibration hand piece that produces a 3 direction movement. The fat cells are then removed from your body through a suction process. HD Lipo is a suitable procedure for both men and women. The procedure only targets fat cells, leaving surrounding tissues undamaged, and involves minimal downtime. Our experience tells us that HD Lipo is the most effective minimally invasive method of removing unwanted fat from your body, creating a defined and sculpted area. Following your treatment you will see immediate results showing improvement in the contour of the area treated. The vibration of the HD device gently removes the fat while keeping the connective tissue intact, and helps to stimulate the production of collagen for up to 6 months post-treatment. Immediately following your procedure, you will be dressed in a compression garment and will walk out of our office. Most patients feel tender and sore in the treated areas, as if they had worked out extensively, but the discomfort resolves within a few days to a week. Most patients feel good enough to return to work within 24-36 hours. Men and Women of all sizes are candidates for HD Liposuction. Age and weight restrictions have been lifted with the latest advancements in lipo. Many patients have localized fatty deposits that have been resistant to diet and exercise and are within 30 pounds of their ideal weight. Unlike other technologies, HD Lipo can also be used to help improve their confidence and comfort during exercise. The treatment is best suited towards those with stubborn, distinct areas of fat around the body that just won’t budge, no matter how much exercise or dieting is undertaken. When you lose weight, is it usually most noticeable on your face and upper body, leaving behind more resistant areas, such as the hips, buttocks, thighs and abdomen? 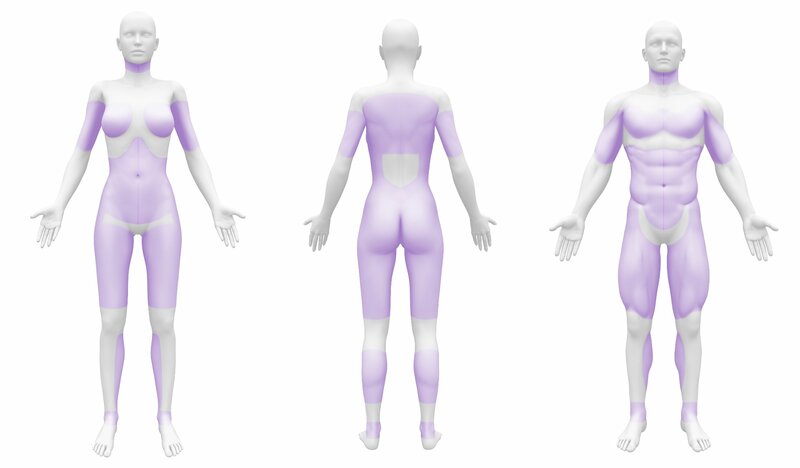 Fat distribution can be incredibly uneven, leaving some areas more out of proportion than others. Diet and exercise can only do so much for most people. HD Liposuction can help adults of all ages and most parts of the body affected by stubborn body fat. It improves the balance of distribution of fatty tissue around your body, for a more aesthetically pleasing profile. Although liposuction can often provide very substantial improvements, it is not a weight-loss technique, or a solution for obesity. Ideally, any treatment should be viewed as a compliment to regular exercise and good diet, and not the replacement of a healthy lifestyle. HD Liposuction is carried out under local anesthetic, so you’ll feel no pain during the treatment. If you are feeling anxious, we can also offer sedation to help ease your nerves. What happens if I gain weight after HD Liposuction? Although it is highly recommended to try and maintain your weight after your treatment, it is possible to gain up to 5-7 pounds before you notice any obvious change in the treated area. With HD Liposuction, superficial fat and fat cells are removed, and as the body doesn’t readily make new fat cells past puberty, the results are more or less permanent. Any mild weight fluctuations are therefore not noticed as the extra fat is either immediately processed or evenly distributed around your body. This will depend on the number and size of areas to be treated, but generally, the HD Liposuction procedure lasts between 1 and 2 hours. The results will last as long as you maintain your weight. It is advised that you follow a healthy diet and exercise plan to maintain the results. Are there any side effects from HD Body Scuplting? HD Liposuction exemplifies the safest and most effective tool used for liposuction and body contouring. However, the skills and expertise of your surgeon are what count in the success and results of the procedure, as well as your chances of any complications. Is HD Liposuction worth it? For those who are serious about sculpting their figure and committed to maintaining a healthy lifestyle, HD Liposuction is second-to-none in terms of its precision and results achievable. Significantly less invasive than traditional liposuction and offering minimum downtime, HD Lipo gives a body sculpting experience that may be very difficult to achieve from diet and exercise alone and can be used on fat stubborn areas of the body including the abdomen, thighs and upper arms.